TIP: If you can’t find whole-wheat pastry flour, substitute cake flour. Position a rack in the center of the oven and heat the oven to 350°F. Line a 12-cup muffin pan with paper liners. Combine the cake flour, whole-wheat pastry flour, baking powder, and salt in a medium bowl. Put the butter in a large bowl and beat with an electric hand mixer on medium speed until smooth, about 3 minutes. Gradually add half of the sugar and continue to beat until fluffy, about 2 minutes. Add the oil and remaining 1/2 cup sugar and continue to beat until lighter in color, about 2 minutes more. Add the eggs one at time, beating well after each addition. Beat in the applesauce until combined. On low speed, add half of the flour mixture to the butter mixture, then half of the milk, mixing just until combined after each addition. Repeat with the remaining flour and milk, adding the vanilla with the milk. Distribute the batter evenly among the cupcake liners and bake until a toothpick inserted in the center of a cupcake comes out clean, 20 to 25 minutes. Transfer to a rack and cool in the pan for 15 minutes; remove the cupcakes from the pan and let cool completely. Put the raspberries in a 1-quart saucepan and cook over medium heat until they begin to release their juice and break down, about 5 minutes. Strain the berries through a fine sieve set over a small bowl, pressing with a spatula to extract all of the juice (you should have about 1/4 cup). Discard the seeds. Let cool to room temperature. Combine the cream cheese and confectioners’ sugar in a medium bowl. Beat with an electric hand mixer on high speed until smooth, about 2 minutes. Add the raspberry juice and continue to beat until well combined, about 1 minute. Cover and refrigerate until thicker and spreadable, about 2 hours, before spreading on the cupcakes. 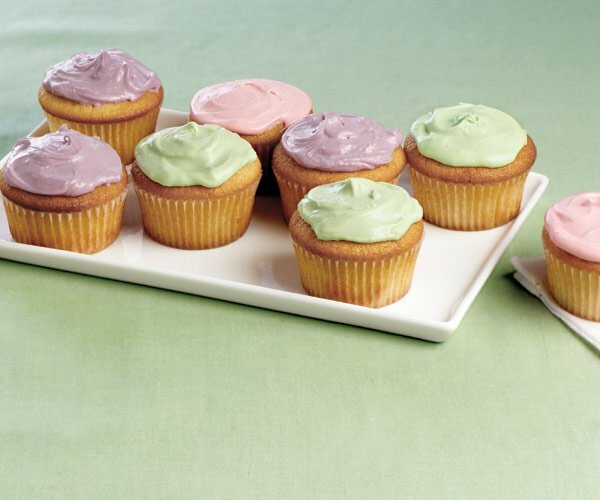 The frosted cupcakes can be refrigerated for up to 1 day. For purple frosting: Substitute 2 Tbs. thawed frozen grape juice concentrate for the raspberry juice. For green frosting: In a small bowl, mix 1/2 tsp. green tea powder (matcha) with 1 tsp. boiling water to form a paste; then stir in 2 Tbs. more boiling water. Cool slightly. Substitute the tea mixture for the raspberry juice.